In the photo above Soke Anshu is teaching how to make traditional Metsubishi (目潰し) using egg shells and traditional powders and at the Budo Ryu Hombu Dojo. One type of metsubushi was a powder made up of ashes, ground-up pepper, flour, and dirt. For severe damage, it could also include fine-ground glass or metal shavings. It was kept in hollowed-out eggs (happō), bamboo tubes or other small containers. Voidness is that which stands right in the middle between this and that. The void is the all-inclusive, having no opposite. There is nothing which it excludes or opposes. It is living void, because all forms come out of it and whoever realizes the void is filled life and power and the love of all beings. Budo Ryu; School of the Warrior Way. This entry was posted on August 27, 2012 by Soke Anshu. 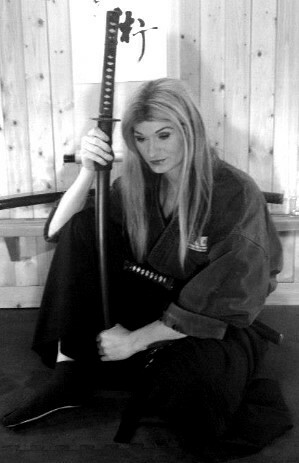 It was filed under Uncategorized and was tagged with Anshu Christa Jacobson, ban ryu, Budo Ryu, grandmaster, Koga Ryu, Koka Ryu, metsubushi, Ninja, Ninjutsu, shinobijutsu, soke, soke anshu, Tomo Ryu, void.